The Liberal-dominated House Committee denied workers an opportunity speak at the Temporary Foreign Worker Program (TFWP) review and only listened to employers and organizations representing employers, the opposition New Democrats stated in the dissenting report on the controversial program, where they called the review a public relations exercise. The Temporary Foreign Worker Program (TFWP) review conducted by the [Standing Committee on Human Resources, Skills and Social Development and the Status of Persons with Disabilities] HUMA committee has been opaque, confusing, and completely inadequate. The review was conducted over the course of only five sessions, many of which were cut short. In this incredibly short amount of time, we were expected to review programs related to migrant workers including the Temporary Foreign Worker Program, the Seasonal Agricultural Worker Program and the Caregiver Program. Given the limited scope, we are concerned that this review was intended as a public relations exercise rather than as an opportunity to provide meaningful recommendations for change. We are also troubled by the lack of commitment shown by the government to continued consultations with stakeholders while the government proceeds with reforms to the program. This is particularly concerning given how few voices have been heard so far. The committee should have prioritized the voices of workers. Instead, the committee mostly heard employers and employer organizations. There was not enough opportunity to hear from migrant workers directly. Canadian workers were also barely represented, despite the fact that employer abuse of the TFWP has resulted in layoffs, higher unemployment, and lower wages for Canadians. It is imperative that workers have the opportunity to share their side of the story. We cannot complete an adequate review without the perspectives of both workers and employers. The committee had almost no opportunities to hear from Canadian workers how the TFWP has affected them. The committee also considered very little evidence regarding the impact of the program on the Canadian labour market. This is all the more shocking given the number of high profile stories in recent years about Canadians who were fired from their jobs and replaced with temporary foreign workers. 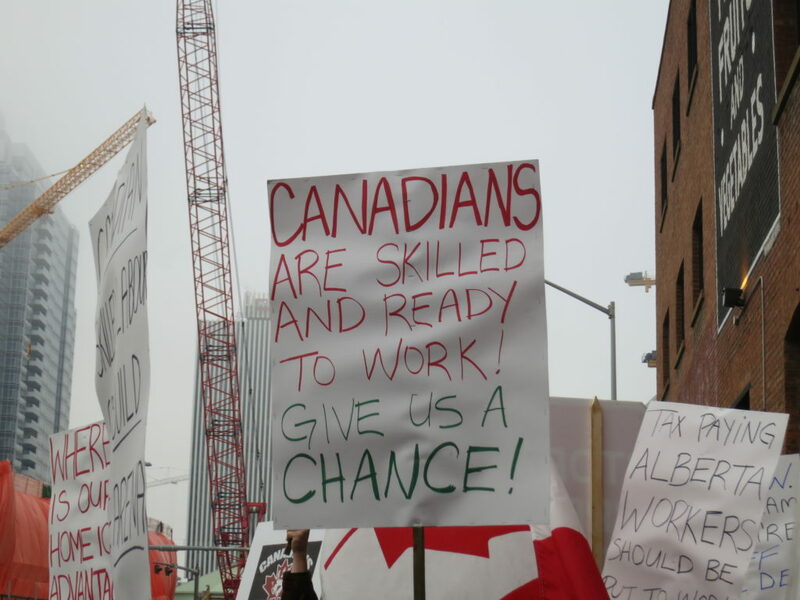 There are also Canadian workers who have been bypassed for available job opportunities because employers prefer to hire migrant workers. Experts have also noted that the program has the effect of driving down wages for Canadian workers. Part of the problem has been a failure on the part of the government to enforce its own rules regarding prevailing wages, allowing employers to hire temporary foreign workers at lower wages than Canadian workers. It is also troubling that the new Liberal government has loosened requirements and made it easier for certain employers to access temporary foreign workers. This is despite the fact that the Department of Employment of Social Development advised the Minister that employers in the industries affected were not doing enough to try to attract Canadians, such as raising wages and making jobs more appealing to Canadian workers. Many experts, including the Parliamentary Budget Officer, have also pointed out that there is little evidence of real labour shortages in Canada, in part because labour market information is so poor and lacks the kind of specificity needed to accurately identify labour shortages. The government needs to improve its collection of labour market information, ensuring that the temporary foreign worker program is only being used to fill genuine labour shortages, and that the positions being filled are truly temporary and not permanent positions. The government also needs to ensure that the necessary tools are in place to fill permanent positions with Canadians or with immigrants who are able to come as permanent residents with all the rights and protections that entails. This means investing in training for Canadians, easing barriers to labour mobility (such as providing tax credits for Canadians who move to other provinces for work), providing education and supports for communities who are traditionally underemployed (such as Indigenous persons and persons living with disabilities), and enforcing transition plans for employers who are currently filling permanent positions with temporary foreign workers. I have a solution, why don’t all workers across Canada join together and shut Canada down for 1 or 2 days think about the affect it would have?